Over the course of the past 30 years, millions of satisfied customers have experienced the beauty and wonder of our incredible oceanic world through SNUBA. LEARN MORE! 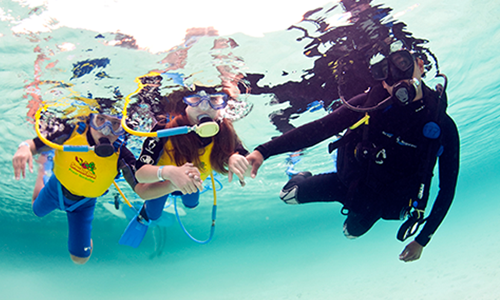 SNUBA is the perfect cross between snorkeling and scuba diving. While breathing through a simple-to-use regulator that’s connected to an air supply that floats comfortably at the water’s surface, SNUBA allows you to explore a three-dimensional underwater world you simply can’t enjoy when snorkeling! SNUBA can be enjoyed at any depth – at the surface, 2 feet, 10 feet or even 20 feet – without any certification or heavy, cumbersome air tanks. A highly trained and certified SNUBA Guide will even be with you throughout your entire tour! Since 1988 and the opening of our first commercial operations in St. John, U.S. Virgin Islands and Maui, Hawaii, millions of underwater tours have been conducted. Today, SNUBA Recreational Centers can be found in locations that span from Hawaii and Mexico to Florida, the islands throughout the Caribbean and even Australia! Looking to SNUBA on your next get-a-way? Our ‘Where to SNUBA’ page will provide you with a complete listing of geographic locations where you can click directly on a specific SNUBA Operator’s page and even book your tour! Our SNUBA Adventure program is an incredibly unique, entertaining experience that allows you to be in and out of the water in less than an hour; offering an extraordinary experience without time-consuming classes or training. 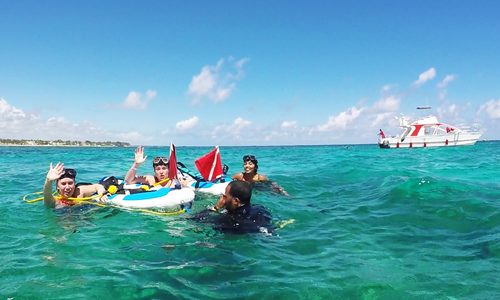 SNUBA Doo® allows kids six years and older to join their siblings, parents or family members on a shared SNUBA tour. Kids wear a specially designed, highly adjustable floatation vest which keeps them buoyant at the surface, while their family members SNUBA dive below them. The SNUBA Doo program is an excellent opportunity for the whole family to participate in a SNUBA tour.